This is the tote bag I finished today (well, I've still got a little bit of handsewing on the inside to to). I bought the raggy fringe from Flights of Fancy boutique in USA then had to choose colours to match. The fringe was a sludgy purple/cerise pink/olive/turquoise/old gold blend so was quite difficult. I put a plain fabric back on it with matching lining. The handles are from my usual source! Charity shops!!!! 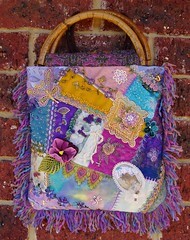 Vivienne, I'm from the hand embroidery group and I enjoyed your blog. This purse is great, as is all of your art. Your property looks like a wonderful place and your studio will be awesome! I'd love to just have my own room for crafties!